Government of Canada took the initiative in 1998 to establish a non-governmental Committee to explore the establishment of a Forum of Federations – an organisation that would provide opportunities for practitioners of federalism throughout the world to exchange information on best practices and experiences, and which would engage in projects designed to improve federal governance. The Forum’s first major activity was the International Conference on “Federalism in an Era of Globalization”, which took place in Mont-Tremblant, Quebec, Canada from 5–8 October 1999. The conference focused on the challenges for the management of federal and decentralised systems at a time when the significance of international borders is declining. This brought together over 500 elected representatives and civil servants from different levels of government within federations, academics, private sector and NGO representatives, and youth delegates from over 25 countries. The Forum’s success in gathering, from around the world, an impressive array of those active and interested in the practice of federalism lent further support to the idea of a permanent international Forum. As a consequence the Canadian government agreed to be the first co-founder, and a new international Board for the Forum was established. In January 2000, the Forum of Federations began work as an ongoing insti-tution. The deliberations were structured to maximise the opportunity for participants to share infor-mation, best practices, and experiences in problem-solving. 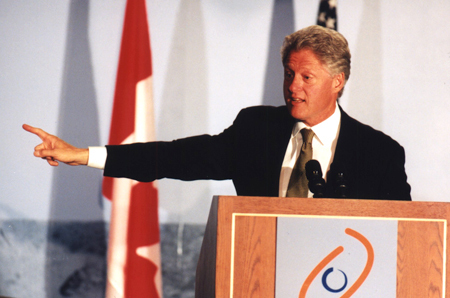 Presentations at plenary session by heads of state, such as President Bill Clinton, and leading political figures from many other federal countries, were interspersed with a large number of small roundtable workshops. In addition to three plenary sessions of the conference, there were plenary sessions for each of four main themes: (1) social diversity and federalism, (2) economic and fiscal arrangements, (3) intergovernmental relations and (4) federalism and the welfare state. There was also a range of 30 smaller workshops on various practical issues relating to the operation of federal systems, and for each of these workshops a background paper was prepared in advance, for distribution to all the participants before the conference. In order to ensure that the conference was practitioner-oriented, practitioners were asked to lead the workshops, thereby establishing a convention for the following conferences. This ensured that the conference addressed practical policy issues that contributed to an of exchange information on best practices and experiences. From that vast array of presentations and background papers at the Forum, a selection was chosen for publication in issue 167 of the International Social Science Journal, to provide an insight into a range of salient issues within contemporary federations. This became the proceedings of the conference and was published in several languages. The discussions are summarized below. The discussion of this theme pointed to the disappointing consequences of the centralism of so many of the first-generation leaders on the African continent, and argued for the potential of federalism as a way of achieving internal harmony among seemingly irreconcilable distinct groups. The theme examined the issue of how to construct institutions to reconcile ethnic and cultural diversity with a mature and cohesive nationhood. This first conference also provided the opportunity for practitioners to identify different models of federal power sharing. The discussions also focused on the accommodation of specific aspects of social diversity within federations. The sessions examined diversity as an issue not only of human rights, but also of accommodation, through establishing institutions that uphold existing diversity. The impact of distinct national groups within federations, and the challenge of religious and linguistic diversity within federations were all considered. With respect to economic policy, the sessions analyzed the advantages and disadvantages of the federal model for economic policy-making. The financial arrangements in federations have invariably had a crucial impact on the operation and evolution of the feder-ations themselves. Two aspects of such financial relations were analyzed, i.e. the tax assignment question, of which level of government should levy taxes and which bases they should utilize, and the use of equalizing transfers from federal governments to governments of constituent units in order to meet imperatives for equity and efficiency. Also discussed were the advantages and disadvantages of devolution in the context of income support policies and objectives of inter-regional and intra-regional equity. Given the impossibility of distributing powers between levels of government into watertight compartments, interdependence and interpenetration have been common features of the operation of governments within federations. Work sessions reviewed the factors shaping intergovernmental relations and forms of their institutionalisation, as well as surveying the large variety of mechanisms for conducting relations between federal, regional, and local governments. The conference also identified four broad approaches to conflict management in federal systems. Emerging levels of government are increasing in importance in many contemporary federations. One of these is the pressure of indigenous peoples for their own autonomous units of government. The conference, examined the issues of self-government for indigenous peoples and the resulting impact on intergovernmental relations within federations. Another increasingly important level of government is local government. The conference highlighted the role of local governments and the new phenomenon of international cities in terms of their growing impact within federal systems. Given the conference title “Federalism in an Era of Globalization”, the conference expended much time in considering new challenges that globalization was bring to federal governance. Issues of governance, equity and new were opportunities considered as were the role of technology and external pressures in shaping the future of federal governance. These issues were particularly relevant because federations contain nearly two billion people representing about 40% of the world population, and they encompass about 480 constituent units or federated states. And if one were to include other variations such as decentralizing states, or emerging federations or supra-national entities, issues of federalism have a direct impact on governance for over half of humankind. A striking conclusion that emerged from this conference was the degree to which contemporary federations are facing many of the same problems and issues. Equally striking, however, was the enormous variety in the ways in which different federations have responded to these. There is much to be learned, therefore, from exchanging information and from the lessons, both positive and negative, of the experience of others. The Forum’s success in gathering, from around the world, an impressive array of those active and interested in the practice of federalism lent further support to the idea of a permanent international Forum. As a consequence the Canadian government agreed to be the first co-founder, and a new international Board for the Forum was established. In January 2000, the Forum of Federations began work as an ongoing institution. Regional Economic Development: Building Partnerships or Transfer Dependencies? © 2019 Forum of Federations. All rights reserved.